If you are looking for wireless headphones for Samsung TV, you’re in the right place. 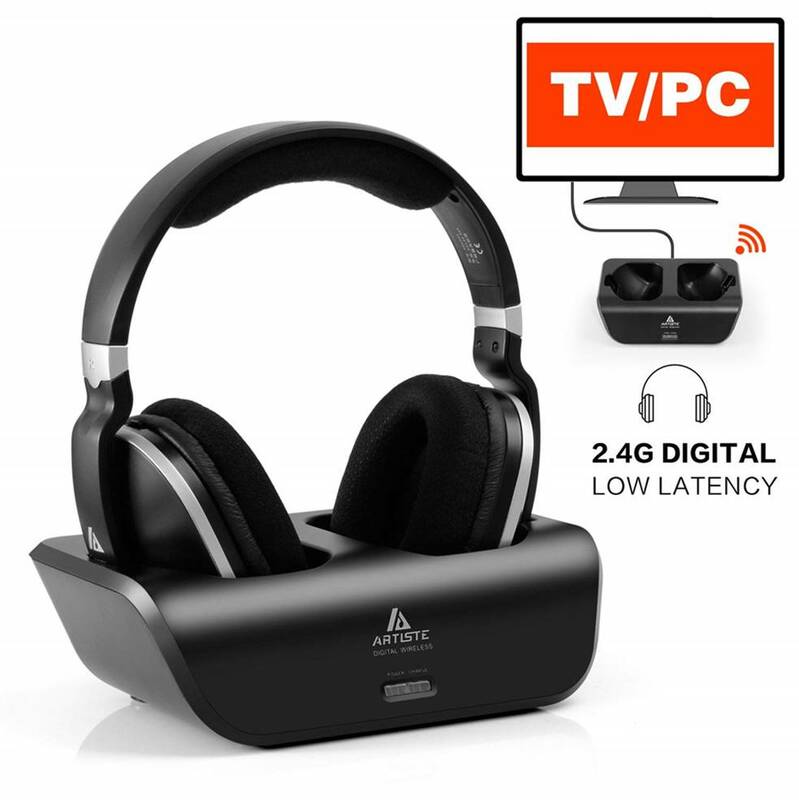 These wireless headphones are handpicked due to their ability to connect directly with your Samsung TV and stream audio wirelessly directly from a wireless charging dock. These wireless headphones come with a dock which connects to your Samsung TV via digital, optical or 3.5mm outputs, and transmits audio wirelessly to the headphones. Check if your Samsung TV supports wireless Bluetooth: the latest versions of Samsung TV should support built-in Bluetooth functionality. If your Samsung TV has wireless Bluetooth built-in, all that is required is a wireless Bluetooth headphone (without a dock) to connect to your TV via Bluetooth. You would be able to hear the TV audio clearly through these wireless headphones. Check for audio optical, digital or 3.5mm outputs: To connect the headphone dock to your Samsung TV, your TV will need to support either one of these outputs. Be sure to check that the wireless headphone with dock supports the audio output from the back of your Samsung TV. Note that newer versions of Samsung TV have phased out RCA cables. The Artiste wireless headphones for Samsung TV provide crystal clear audio transmission without any lip-sync delays. 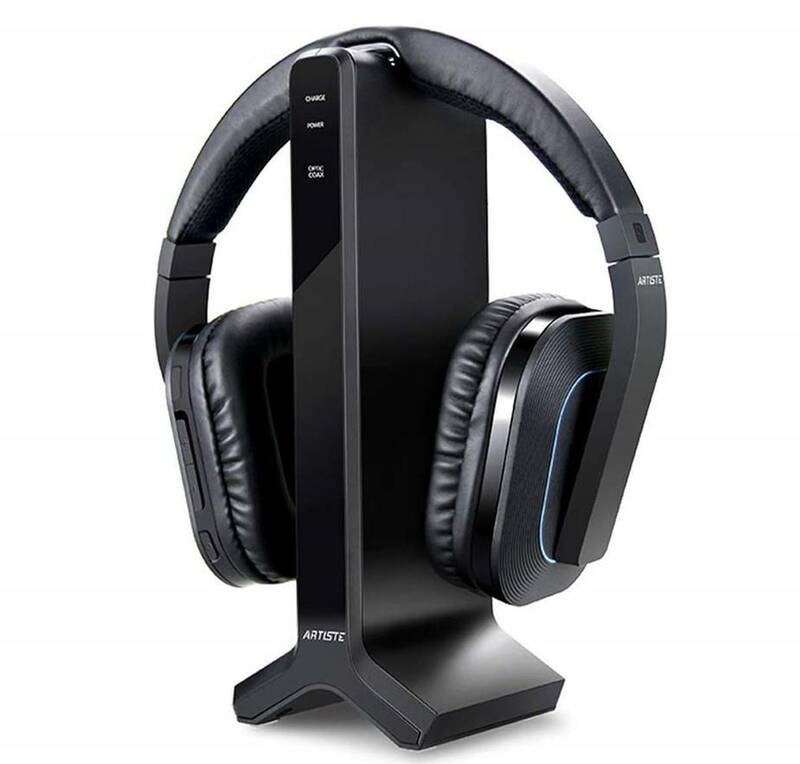 These headphones and wireless dock comes with 2.4GHz RF technology which provides better wireless range and consistent signal transmission with allow distortion. This allows you to listen to music while walking around in your home without any interruptions – it has triple the wireless range of traditional Bluetooth headphones with a range up to 100 ft. The ADH300 headphone provides crystal clear Hi-Fi stereo sound quality with a frequency response of 25 Hz to 20 kHz. It comes with a digital signal which provides extra bass and crisp treble ranges without any distortion. 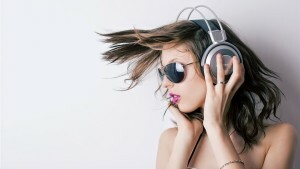 The headphone is compatible with tablet, iPads, laptops and computers as well as Samsung TVs that support auxiliary outputs. The headphone dock supports RCA and 6.3mm adapter for easy access to your TV audio source. Furthermore, these headphones are comfortable to wear with a soft-padded headband and over-ear padding which are designed to provide maximum comfort. It has fully-sealed ear pads which effectively reduce the sound leakage while watching TV shows or movies. The headphone comes with a built-in battery that provides up to 20 hours of continuous music playtime on a single charge. 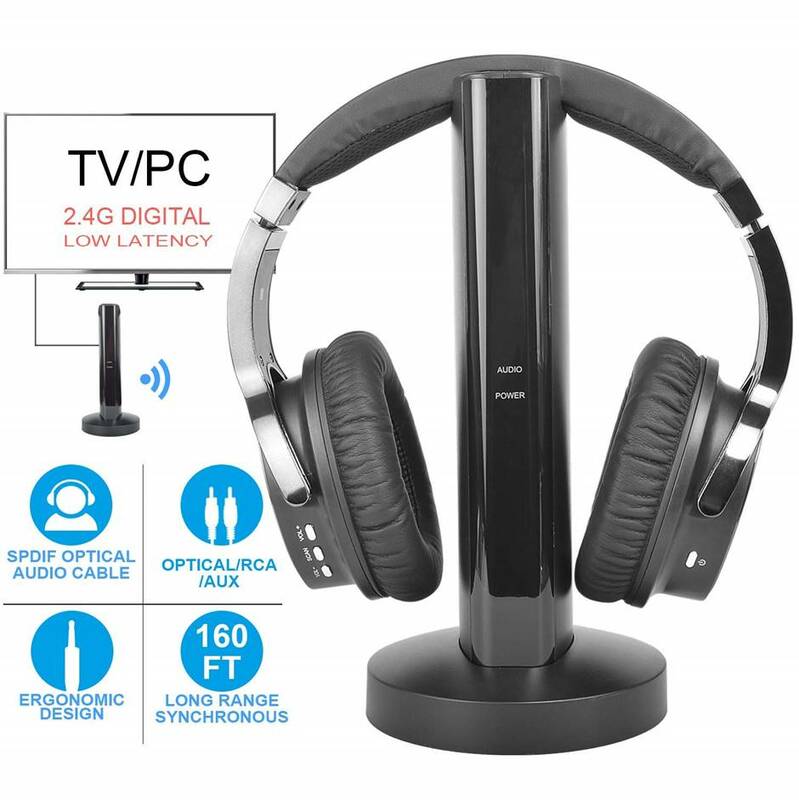 Do note that if your Samsung TV only has an optical digital audio output, you may need a digital to analog converter for this wireless headphone dock. The Artiste D1 are some of the best wireless headphones for Samsung TV that provide great value for money. The wireless dock that comes with the headphone supports optical, 3.5mm auxiliary and RCA audio outputs, and are compatible with almost any Samsung TV. The headphone features 2.4 GHz RF technology which provides better wireless range, steady signal transmission and lower distortion, allowing you to listen to your TV audio while walking around your room without interruption. We found that the sound performance of the Artiste D1 headphones is very good, with crystal clear highs, detailed midranges and good bass response. The D1 headphones have clean sound quality, and also provide low-latency stereo sound with a frequency range of 30 Hz to 20 kHz. We did no experience any audio lag while streaming music from the Samsung TV to these headphones. The Artiste D1 headphones has a wireless range that reaches up to 100 feet, with up to 12 hours of continuous music playtime on a single charge. The headphone itself is very comfortable to wear and features an elastic headband with lasting comfort. The headphone comes with the 2.4 GHz transmitter charging base unit, RCA cable and power adapter together with a user guide for easy reference. The Avantree HT280 are some of the best wireless Samsung TV headphones that provide crystal clear audio performance with versatile connectivity options. The HT280 comes with an all-in-one charging dock and transmitter that automatically connects wirelessly to each other – the charging dock connects to your Samsung TV with optical, 3.5mm or RCA audio ports. In terms of sound performance, the HT280 headphones provide full-range sound quality that feels consistent and enjoyable to listen to. We did not detect any hissing noises while streaming music over the TV or any lip-sync issues. The HT280 can produce plenty of volume without any distortion and you can hear movie dialogues and sound effects clearly. The HT280 headphones feature 2.4 GHz wireless technology which allows you to watch TV in perfect synchronization and without any lip-sync issues. We also liked the 12 hours of battery life that the built-in rechargeable battery provides. Do note that these headphones use 2.4 G RF wireless technology and is not compatible with Bluetooth devices other than your TV. The Rybozen Wireless headphones are great headphones for Samsung TV that provides superb sound performance and audio clarity. These headphones are designed to deliver crystal clear sound with efficient low-power consumption and digital signal processing with deep bass. 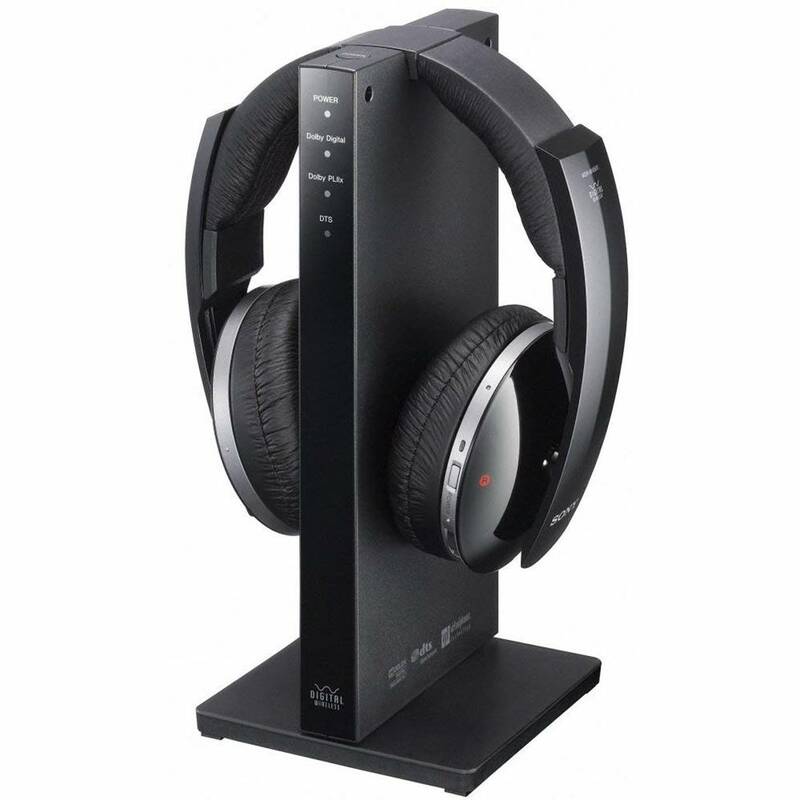 The headphone charging dock supports optical (SPDIF) connection, 3.5mm auxiliary and RCA audio output and connects directly to your TV audio output. 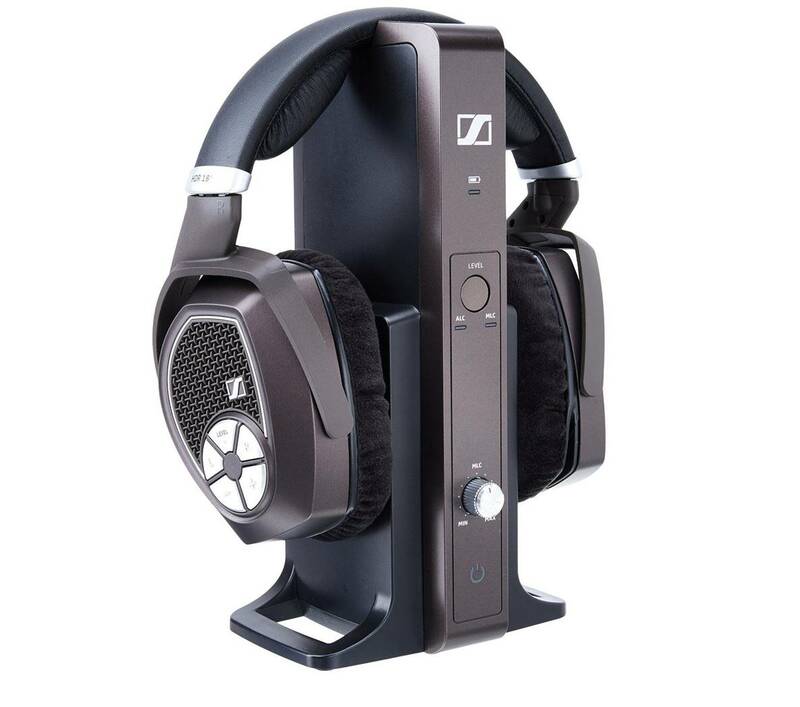 The headphones support 2.4 GHz technology with a wireless range up to 160 feet. This expanded wireless range allows the headphones to be used when not in sight of the transmitter. It also has a modern and comfortable design with soft-touch padded cans that feel comfortable over the ears. The transmitter that comes with these headphones also serves as the charging dock and connects directly to your Samsung TV. Movies and TV shows sounded very clean and crisp on these headphones, and it also projects a good level of mid-bass and lower-frequency ranges as well. The headphones come with included rechargeable li-ion batteries that last approximately 18 hours on a full charge and recharge automatically when placed on the base station. The headphones features 2.4 GHz wireless technology which allows you to watch TV without delay – the sound and screen are in perfect synchronization. It takes a total of hours to reach a full charge and has a signal to noise ratio of 85 dB. 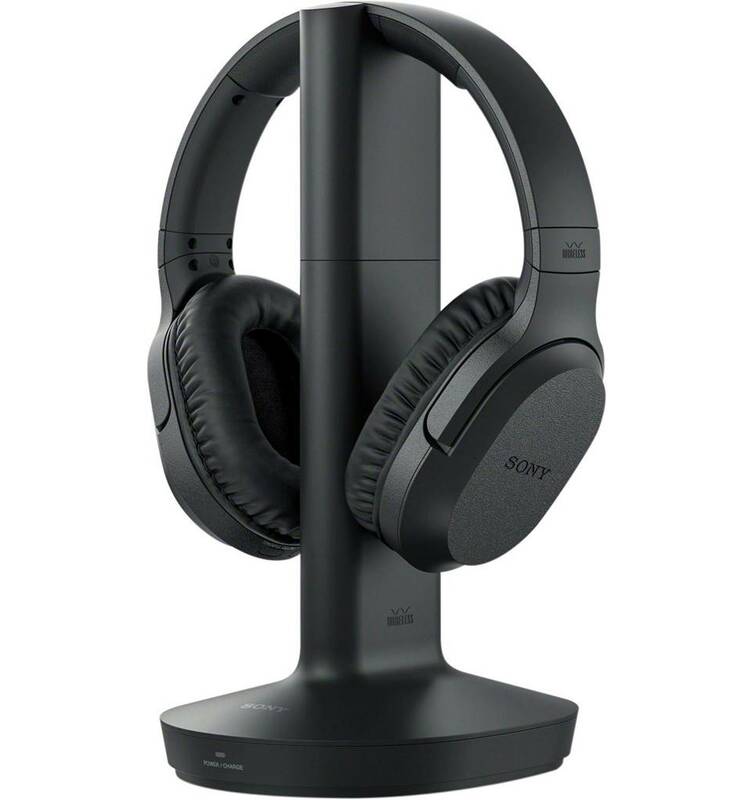 The Sony RF995RK are some of the best wireless headphones you can use from your Samsung TV that provides high-quality sound. These headphones feature easy wireless connectivity that allows you to move freely up to 150 feet through walls and ceiling without any syncing issues. It comes with a built-in battery that provides a whopping 20 hours of continuous music playtime on a single charge. We loved the sound quality from the Sony RF995RK headphones. These are high-fidelity headphones designed to provide a sensational HD sound performance – it delivers high-fidelity sound and punchy bass with decent noise reduction. It also features a voice mode which enhances the dialogues in TV shows and movies, and has an easy volume control and auto-tune functionality that allows you to adjust the sound depending on your preferences. The Sony RF995RK headphones are optimized for cinematic performance with powerful 40mm drivers that render clear, warm and detailed sound for hi-fi entertainment. Do note that your Samsung TV needs to have either left or right RCA output jacks to connect to the headphone transmitter, or through the 3.5mm auxiliary input. The Sony headphones are very comfortable to wear and have a good wireless range, so you can listen to movies and music for prolonged periods of time without feeling fatigued. The Sony MDR-DS6500s are great wireless headphones for Samsung TV that can provide 3D surround sound performance. These headphones provide a superb cinematic sound experience at home and feel as though you are listening to an expanded sound system within these headphones. They come with large 40mm drivers that have a wide dynamic frequency range so you can pick up almost every single detail in the music with good clarity. The sound from these headphones is crisp and clear with deep bass performance and precision sound performance. The Sony MDR-DS6500s have a built-in battery that provides up to 20 hours of continuous music playtime on a single charge. These headphones come with a stylish charging dock that looks great on any bookshelf or side table and are very comfortable to wear. 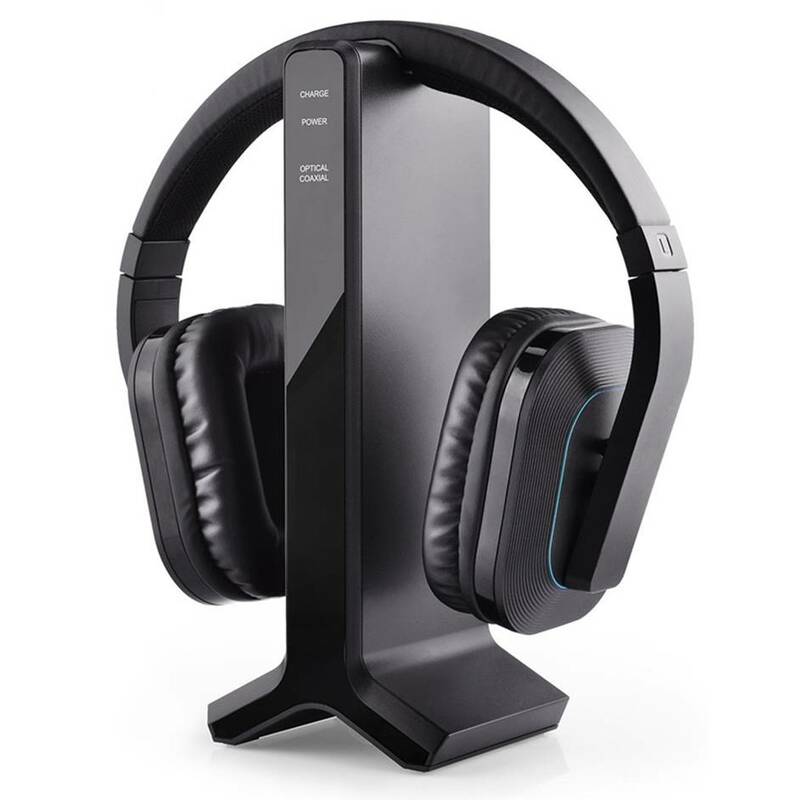 The MDR-DS6500 headphones support digital wireless streaming from non-compressed 2.4 GHz / RF digital transmission, which provides virtually no lip-sync delay between your headphones and the TV. We liked the fact that these headphones provide automatic real-time tuning which gives you the best digital signal up to 328 feet range. It also provides a simulated cinematic surround sound experience with 7.1 and 3D sound performance. If you are looking for a surround sound headphone for your Samsung TV, the Sony MDR-DS6500s are a great choice. 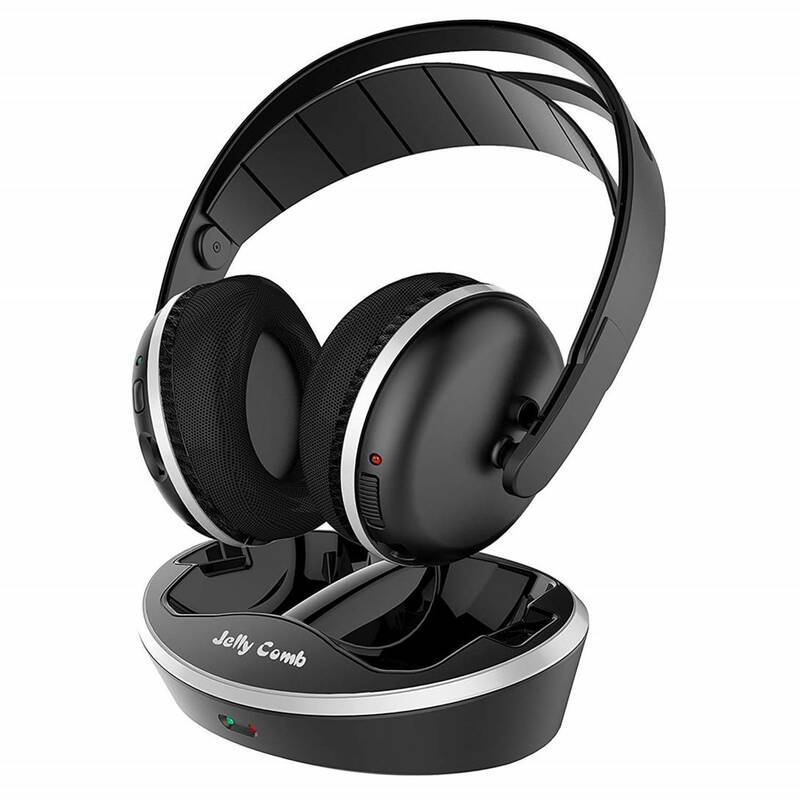 The Jelly Comb wireless RF headphones are some of the best wireless Samsung TV headphones available that deliver advanced sound performance with wireless RF technology. The headphone dock is designed to connect to multiple devices through the 3.5mm auxiliary or RCA audio output – do note that the Jelly Comb dock does not support digital audio outputs. 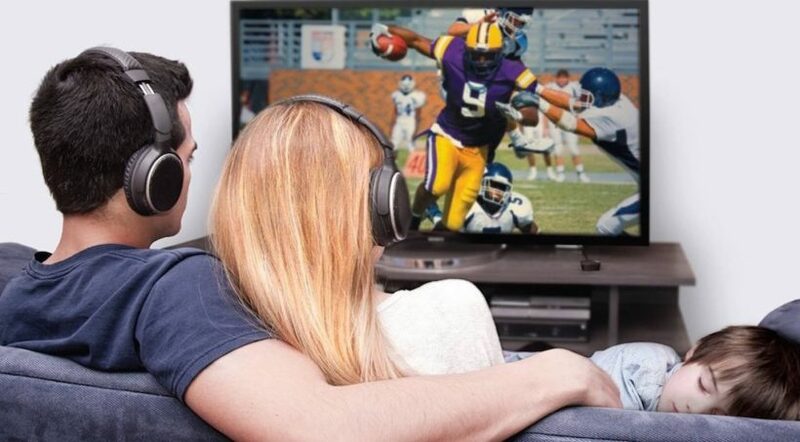 These headphones provide a superior sound experience while allowing you to listen to your favorite TV shows, sports and movies with detailed sound effects and precision. The crisp, clear stereo sound provides you with an enjoyable sound experience. We liked the advanced wireless RF technology that allows the headphones to receive wireless RF signal from the transmitter dock; it has a superb range of 328 feet in an open area and 66 feet at home, so you can walk around your home while listening to TV shows. The headphone comes with a RF transmitter and charging dock – the TV headphones can be easily recharged by placing it on the charging doc. The dock also works as an RF transmitter which has 3 adjustable signal channels, so you can choose an interference-free channel for clear reception. The headphone also features a lightweight over-ear design for long listening sessions. It comes with an adjustable headband, soft ear pads and sweat dryer technology memory foam. The entire package comes with the TV headphones, charging dock, DC adapter, RCA cable, 3.5mm audio cable and 6.3mm jack adapter for easy installation. 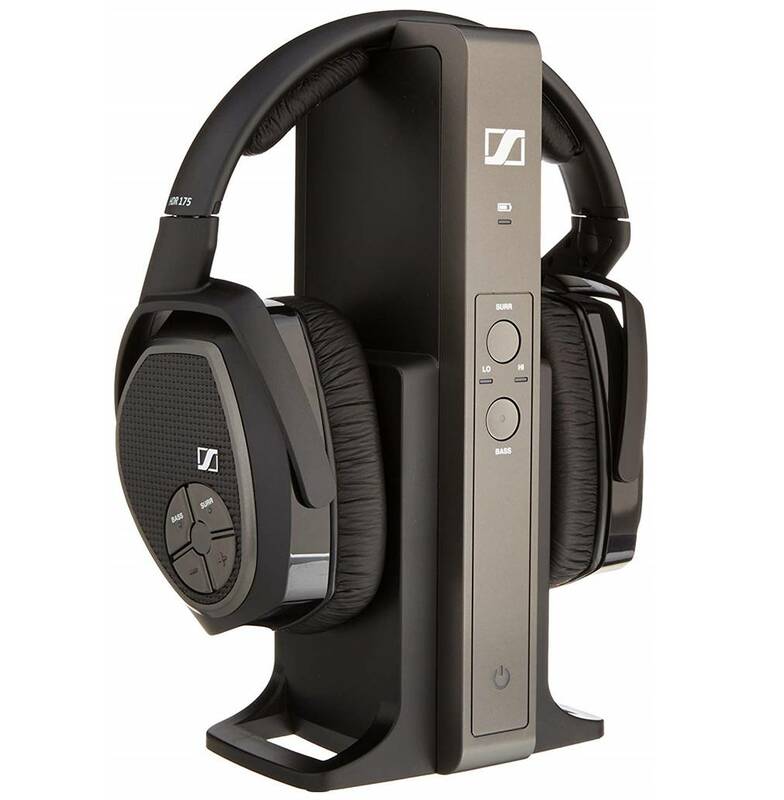 The Sennheiser RS 185 are among the best wireless Samsung TV headphones that feature an audiophile style open-back, circumaural headphone design with excellent wireless audio transmission. The headphone has a superb wireless range of up to 328 feet and supports wireless RF technology streaming for perfect synchronization. The Sennheiser RS 185 headphones are equipped with high-performance transducers to deliver precise, detailed and dynamic sound performance. It has a multi-purpose transmitter which supports both digital and analogue inputs for easy connectivity to your Samsung TV. The charging dock also supports automatic and manual level controls, and functions as an “easy-charge” cradle for the headphones. The RS 185 headphone supports multi-receiver transmission which supports up to two pairs of headphones simultaneously. We thoroughly enjoyed the sound quality on the RS 185 headphones. These headphones have an open-back design that produce a natural sound signature with detailed soundstage and separation, and you can hear TV dialogue and audio performances clearly. The headphones provide plenty of volume output without any distortion and have crystal clear audio reproduction throughout. That being said, do note that these are open-back headphones and may be somewhat lacking in bass. The Ansee wireless RF headphones for TV are designed with RF transmitter technology for easy pairing with your Samsung TV. They provide clean sound performance with detailed hi-fi sound, and are very enjoyable to listen to for TV shows and movies. These headphones have a wide frequency range of 20 Hz to 18 k Hz and have a wireless range of around 328 feet. 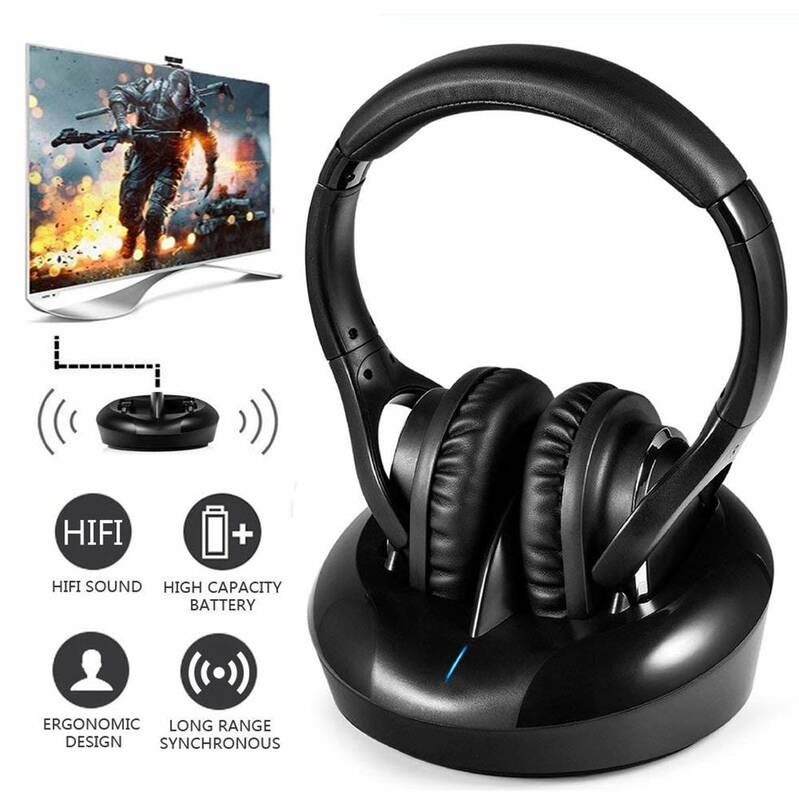 These wireless headphones come with a charging dock which connects to your Samsung TV via the 3.5mm auxiliary input jack, optical or RCA audio output. They are very comfortable to wear and come with an adjustable headband design with a soft rotating ear-muff for easy storage. The headphones are relatively lightweight and can be worn for extended periods of time without feeling any fatigue. It also features a built-in rechargeable lithium ion battery that provides up to 8 hours of continuous music playtime. We liked the RF wireless technology on these headphones which allow you to listen to music or TV shows while walking around your home without any interruption. The RF wireless technology has triple the wireless range of traditional Bluetooth devices. Do note that these headphones do not support Bluetooth connectivity and should be connected through the wireless dock to your Samsung TV. It takes approximately 2 hours for the headphones to fully recharge. The Sennheiser RS 175 are some of the best wireless headphones for Samsung TV that deliver superb bass performance and crystal clear details. These headphones feature a compact and ergonomic over-ear design with wireless Bluetooth connectivity. It supports bass boost and surround sound listening modes with a maximum sound pressure of 114 dB at 1kHz. You can practically crank up the volume on the RS 175 headphones and not hear any distortion form these headphones. We liked the fact that the Sennheiser RS 175 provides digital wireless technology which provides clear and accurate signal transmission. It also comes with a bass boost and surround sound listening modes which enhances your home entertainment listening experience. The bass boost feature provides a much deeper bass response, while the virtual surround sound mode offers a more spacious and lively stereo sound. The RS 175 headphone has digital wireless technology which ensures that the signal transmission remains clear and accurate as you move from room to room. It also features an ergonomic design that provides a comfortable listening experience for extended periods of time without any ear fatigue. Overall, the Sennheiser RS 175 headphones are easy to setup and connect to your Samsung TV headphones and we highly recommend them.